Rhinoplasty is performed implying two major techniques, namely, external and closed rhinoplasty, where incisions are placed inside the nostril to make surgery scarring less visible. Patients considering nose surgery need to be aware of the rhinoplasty swelling following the surgery that usually improves after two weeks but can last up to a whole year. 1. Stay in bed as much as you can for the first few days following the nose surgery to help with your rhinoplasty swelling. You might also feel groggy and develop a headache, which is a normal side effect of your anesthesia. 2. Keep your head elevated and propped up with a couple of pillows even while you are sleeping. 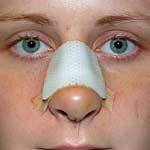 This should help you significantly reduce rhinoplasty swelling and bruising. 3. Apply ice packs to your nose area a couple of times throughout the day to help control rhinoplasty swelling. Take care to wrap the ice pack with a towel or cloth to protect the tender nasal tissues. 4. Avoid hot baths and showers for a couple of days immediately following your surgery due to the possibility of increased swelling. 5. The best rhinoplasty surgeons recommend an innovative approach to reduce post surgery swelling, an electromagnetic device that you can use at home. This patch applied to the swollen areas sends pulsating electromagnetic signals that significantly reduce inflammation and help bring your swelling and bruising down. 6. Stay away from foods that are high in sodium and sugar as they might prevent your body from healing properly. 7. Pineapples contain a natural enzyme bromelane that can boost your body’s natural healing properties and help you recover faster from your rhinoplasty procedure. Having realistic expectations, preparing for your recovery period and following all of your doctor’s orders will help you heal faster and avoid rhinoplasty gone wrong situation.